Documentation is incomplete for some functions. Summary: So, you have a pile of great home video clips from that new digital camera. Wouldn't it be great to put some scenes of cute little junior on your cell phone to show off to friends, or on a DVD to send to Grandma? Or maybe The Kid has some favorite DVDs to watch in the car on a nice little netbook without a optical drive. Search the Internet and you find 100's of choices for "free" video conversion tools; a few hours or days later you've tried 10 or 12 kinds cripple-ware, ad-ware, and nag-ware , rebooted 18 times to install and un-install them, and had 3 crash your computer. And, none of them are really free OR do what you need. Time to get serious. The Daniusoft Media Converter Ultimate claims to be a "multimedia processing Titan" that can " . . . remove DRM copy protection . . . , Rip DVD to most popular video files, Convert Video Music between different files, burn movie to DVD disc, directly transfer songs & video to your portable players like iPod, iPhone, PSP, Cell Phone, etc . . ." Is this Titan worth $59.95? A free trial of Daniusoft Media Converter Ultimate (DMCU hereafter for short) can be downloaded from Daniusoft's Download Center; it is not too big at 18.8MB, so most people will be able to download it in a couple minutes; my home connection took 1.5 minutes. I like that no registration or filling out forms is required before trying it. The package is not digitally signed. While most people may not care I think it is a sign of a conscientious development team that takes the time to get a certificate and sign their distribution packages. The installation took few minutes on my laptop, and seemed to stall at one point, but then finished without errors and without requiring a reboot. A typical desktop icon and a folder entry in the start menu (Figure 1) are installed. Figure 1: Start menu shortcuts. I would prefer the text for the shortcuts were shorter. On Windows 7, you see "Daniusoft" then "Media Converter Ultimate" under that, then two shortcuts with the redundant "Daniusoft Media Converter Ultim" truncated text, and you have to look closely at the icon or mouse-over each to find the one to launch the application. Of course you can change the text if you know how. It would have been nice if the "Order ..." shortcut was removed when I registered the product. The trial version is limited to 30 days and 1 minute of output, and includes a little bit of nagging before the start of an operation. Trial versions of some other products put watermarks in the video output or sound bites in the audio, but this one does not, so if your clip is less than a minute you have a usable result. If you do decide to buy a license, via the SWREG service which I have used many times without problems, you don't have to install a different package; the license key removes the output limitation and nagging dialogs. I like the style DMCU's main window presents, which is sort of industrial with a machined-metal texture with some stylish buttons and a clean appearance. The layout is fairly typical for this kind of utility, with a pane listing file to be converted, a preview pane to the right of that, and an option panel below it all. A rather large title bar seems to be a waste of real estate. The sculpted sides and top look like they are indicating some kind of fly-out panels can be accessed, but they are just for looks (Figure 2). Figure 2: Main window with conversion list, preview window, and option panel. I was able to begin converting files in a few seconds, without reading any documentation or help screens. However I was confused for a second with a "Find Target" button to the right of the "Output path" text box, and clicked that to set the destination, which opened Windows Explorer (for what?). A button labeled "..." is what you use to set the output path. Many of the other buttons have pop-up tool tips when you mouse-over them, but not these for some reason. The type of output is selected by choosing a target device, rather than a file format; for each device, there may be a few or many choices of file types or profiles (Figure 3). Figure 3: Target device menu and file type sub-menu. There are some comments below each file type in the sub-menus, but often there are many choices and the descriptions are not entirely helpful. 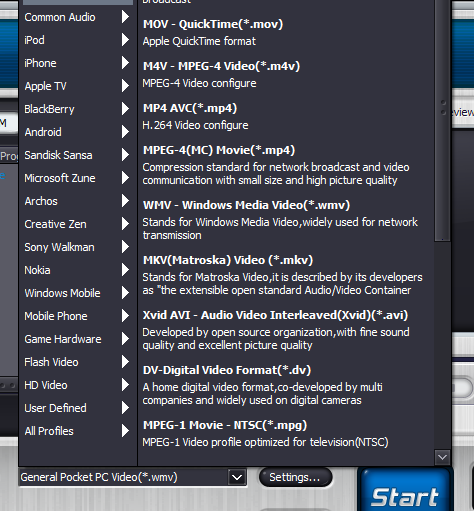 For example "H.264 Video configure" as seen in the above screen shot probably means something to someone, but not me. Sometimes parts of this large menu is not visible on a smaller screen. After one of the pre-defined profiles is selected various parameters can be adjusted, if needed, from the Settings button. 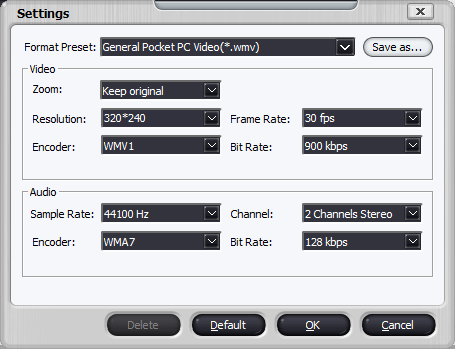 The Settings dialog window (Figure 4) is fairly clear if you are familiar with the basic parameters for video and audio files. Figure 4: Format settings dialog window. If you don't know the difference between Bit Rate and Frame Rate, you may be confused. Only one object has a tool tip shown on mouse-over, and there is no link to the help file. But most users won't need to change these settings and probably won't even look at this window. If you do make changes to these settings, they are automatically saved for that profile, or you can save them as profile with your own name. It is good there is a Default button to restore the settings after you've really screwed them up. Note the Zoom setting, which is a fairly advanced feature. Options besides Keep Original are Full Screen, 16:9, 4:3, Letter box, and Pan&Scan. What I REALLY wish it had was the ability to set the starting and ending position of the input clip. One big reason to buy a product like this instead of using freeware is technical support. I had one problem with the software that was used to measure the quality of their customer support. QuickTime files recorded by an Olympus C-8080 camera would not play in the preview windows; an "access violation" error message from one of the .DLL's was displayed. They converted to WMV fine, so I looked on the support site http://support.daniusoft.com for any known problems. I didn't find any hits so I opened a ticket (under "Ask a Question"). That resulted in to emails right away, one that said it added my address and listing a password for the ticket system, and a second with the ticket info. I very much like that I didn't have to register and created a password before adding a ticket. This was a Saturday night, 10pm EST. I got a real reply at 1:37am the next morning asking me to try reinstalling the application because the symptoms looked like a bad or broken file. Later, I recorded an .AVI file with a Cannon PC1309; trying to preview that resulted in the same error, so I add that information to the ticket. Several weeks and many exchanges with their tech support did not resolve the problem. Of the 6 computers I tried the program the problem went away on one after installing Apple QuickTime player, but that did not help other systems, including a bare-bones XP build. Codec problems are difficult ones to solve, but I could not get them to escalate the problem or admit their DLL should not throw an access violation, which was very disappointing. These files convert fine on all the test systems; the bug is only in the preview function. You can see if it is an issue for you by trying the trial version. Windows Live Movie Maker free; while mostly for editing movies, the "Share" toolbox creates several kinds of output. Creative Centrale free, but you need a Creative Player attached to do a conversion, and a lot of patience to use this painful software. On computer #2 it would not work right so I used Creative Media Converter which is presumably the same engine, but can no longer find to install on the other two computers. 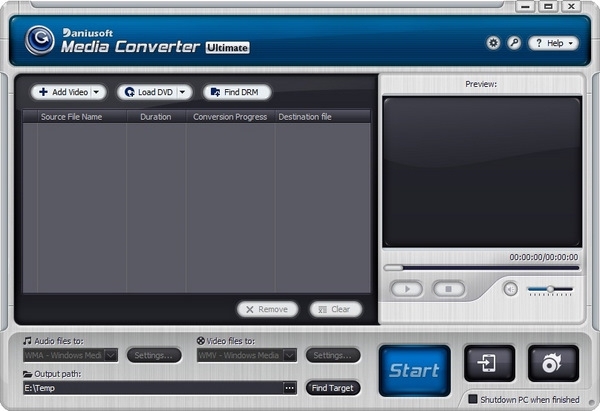 Digital Media Converter 3.01 free trial, license $39.95. Chosen somewhat at random and because the fre trial doesn't limit output length; instead is overlays a watermark on the output. Laptop: a Lenovo X60 laptop with 3GB of memory and an Intel Core Duo L2400 1.66Ghz CPU running Windows 7 Ultimate 32-bit.2. Desktop: a Dell Inspiron 518 with 3GB of memory and an Intel Pentium Dual E2220 2.4Ghz CPU running Windows 7 Ultimate 32-bit (source and target on two different disks). Workstation: a Dell Precision T7400 with 12GB of memory, dual quad-core ... , solid state disks running Windows 7 Professional 64-bit. Quicktime MOV recorded by an Olympus C-8080WZ, 57 seconds, size 320x240, 15fps, file size 17.7MB. AVI recorded by a Cannon PC1309 point-and-shoot camera, 30 seconds, size 640x480 30fps, bit rate 15575kbps, file size 49MB. MPEG4 sample used in Thoughts Media reviews, 48 seconds, size 640x360, 29fps, bit rate 1632kbps, file size 9.35MB. WMV, same clip as above; since target is WMV, this transcoding should be easier. The target format was a 320x240 WMV file with similar but not identical parameters selected with each application. 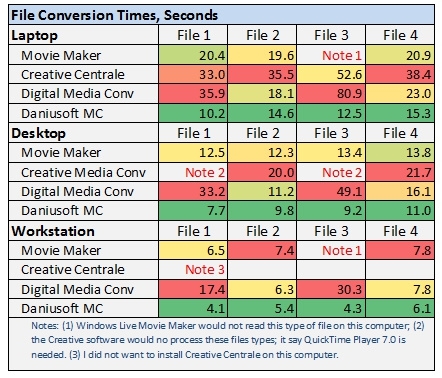 Each conversion was timed 3 times, and the computers were rebooted before using each software package; the average times are shown in Figure 5. Most of the results were good except the MPEG4 test file did not play well when created by not-so-Creative Centrale. Figure 5: Summary of conversion timings. However, later when looking at the results burned to a DVD, I noticed the video converted from File 1 was broken up half way through (Figure 6). Figure 6: Breaking up is (not) hard to do, or . . . tragedy as my son de-res'es on a recent visit to Caprica. On further investigation I found that 8 of 10 Quicktime files had errors when converted to WMV; most errors started about 20 seconds into the clip, but one was ok until 2 seconds from the end, at 2:20. Of the 2 that were ok, one was only 21 seconds long; the other was not recorded by my Olympus camera and had a frame rate of 11fps vs. 15fps for the rest. 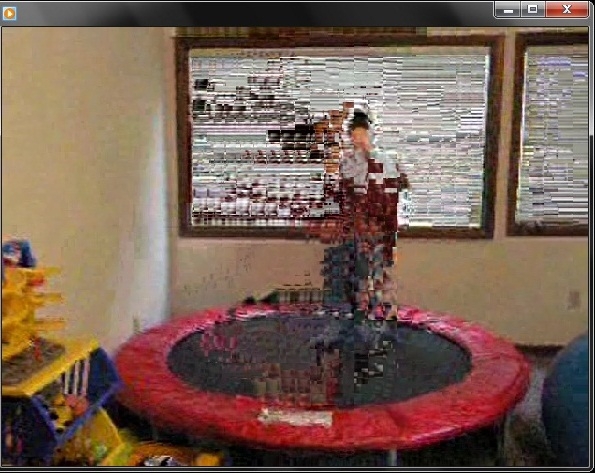 All were ok when converted to MPEG. Changing the encoder from WMV1 to WMV2 or WMV3 did not help, but setting the frame rate to "Keep original" fixed the problem. I can't think of any reason to increase the frame rate when converting a file, so the default setting ought to be to keep the original frame rate. Note that another alternative is Microsoft Expression Encoder 3 (free), which I discovered too late to include in the speed trials. It makes only WMV and Silverlight files, and was slower than the other 4 programs (40 seconds for File 1 on the laptop, 98 seconds for File 2) but it does other things such as screen capture and A/B comparisons (split screen showing input and output at the same time). Anyway, In all cases, DMCU ran faster than the 3 alternatives, and in some cases very much faster. It and Movie Maker appeared to use all CPU cores, while Creative Centrale and Digital Media Coverter seemed to be single-threaded. On the workstation, the DMCU did not "peg" the 8 cores, but ran them about 20% (because the run time was short, it was hard to tell). It would have been interesting to try larger files, or a suite of files, and different kinds of output, but these test were enough to indicate that the software performs very well with the right settings. The program did not detect my Creative ZEN X-Fi or my HTC Touch Pro phone when connected via USB, although Windows 7 recognized both easy, so I was not able to test the function of copying converted media to a device. Since it is easy for me to copy and paste files to these devices when connected to a Windows 7 computer, I'm not sure what it might do to make that easier. DRM (Digital Rights Management) refers to various forms of copy protection, typically designed to allow you to play media on a computer if you are licensed for it. Some schemes may allow copying files to supported media players or to backup devices, but often there are problems and restrictions. Some people are completely against any form of DRM, while others believe it is necessary to protect the media creators. While I tend to think that most people who want to remove DRM protections are going to share the media illegally, a case can be made for removing DRM for fair use scenarios and for backup purposes, which may be legal depending on the source of the material and your local laws. Or maybe your portable device doesn't support the DRM method in the files you have purchased rights for and your source doesn't specifically prohibit bypassing the DRM for personal use. There seems to be a huge number of utilities for removing or bypassing DRM, so it must be a popular thing to do, legal or not. The help file for this program had no topics on DRM removal, but the process was easy compared to finding some files to test. I don't have any accounts in services that provide such files, and I'm sure all or most of them require that you agree not to tamper with the copy protection in the files they provide. Eventually I found a sample .flv (Flash Video) file from http://www.ezdrm.com/html/demo.asp#wmdrm, and installed Adobe Media Player to verify the FMRMS (Flash Media Rights Management Service) was triggered when the file was played. I then tried to preview and convert the file in DMCU, but it didn't do anything; it just said "done", and no output file was created. To be fair, Flash is not a format listed under their description of DRM removal. Another file from the same site, instustrial.wmv (16 seconds 640x352 742kbps), demonstrated the DRM protection in it, so I put it into DMCU and started a conversion. To remove the DRM, it apparently plays the video in a window with Windows Media Player and mfpmp (Media Foundation Protected Pipeline EXE), captures the frames, and saves them in the target format. Elapsed time was 42 seconds for this 16-second clip (on the laptop), so this process is time consuming. Note that DMCU doesn't "crack" the DRM protection . . . you have to have a valid license to play the media for it to capture the frames and/or audio and recode them to another file. One nice feature is a "Find DRM" button that scans a predefined "DRM folder" for files that have not been converted yet; these are automatically added to the processing list, saving you the chore of selecting new files. Although not advertised as a feature, DMCU can extract an audio track from a video clip, making an MP3 or WMA file to put on your music player. You just select MP3 or another audio profile as the video profile. I've needed to do this with a favorite radio program that is not available as a podcast download but is streamed live from various web sites. I use the SageTV plug-in "Web Feed Encoder" to capture the program on a weekly schedule, but it adds a video stream to allow the program to be played through a Hauppauge MPV extender, which is how we usually listen to it. But occasionally I'd rather copy it to a portable player, and a 2-hour show is huge at 3.6GB. It took DMCU 6:30 (minutes:seconds) on our desktop computer to recode one 3.6GB MPEG file to MP3, which was many times smaller at 55MB. In comparison, the freeware/nagware AoA Audio Extractor Basic (AAEB) did the same thing (same 64kbps bit rate, 22050 sample rate) in 5:58, making a file identical in size. If you want a smaller file, DMCU can make a WMA file with a variable bit rate, which is not an option for AAEB. It made a 28MB file from this same 2 hour source in 2:52. On the other hand, AAEB can go as low as 32kbps, making a 27MB file but taking 17 minutes. Doing the audio extraction makes me think it would be nice if the program had a command-line interface, so I could write scripts and schedule tasks to process new files automatically. It probably wouldn't take much for them to add that because most or all transcoding seems to be done by a CmdConverter.exe rather than the user interface presented by DMCUltimate.exe. A typical 120-minute DVD movie was selected for testing. On clicking the "Load DVD" button, you can select titles, chapters, which audio track, and an option to show subtitles. First I selected the "Creative Zen Player" profile, but increased the frame rate to 29.97. On my desktop with a relatively low-cost DVD drive (16X) the copying took 6 minutes, with both cores running near 85%. A second run was tried with the .H264 MP4 profile, 1500kbps bit rate. This took a lot longer (59 minutes) and only one core was busy; a "CmdConverter.exe" used a maximum of 50% total CPU. Clearly that target format was not a good choice. I tried another DVD, one with 11 titles and a 2.5 hour main title. This time the target was WMV (852x480, 1596kbps) and both cores ran about 80%. The conversion took 98 minutes and the results, 1.41GB total size, was jittery and poor quality compared to playing the DVD (7.6GB) on the same computer. Note that the computer was doing some other things at the time (SageTV was recording a show, occasionally taking 10% of CPU) which would account for some of the slowness. I tried converting the main title with the "Creative ZEN Player WMV" profile, which was much faster, finishing in 20 minutes. Quality was reasonable for the resulting file size, about 500MB. There are so many choices for formats and settings within formats, I'm not sure what the best choice would be for an NTSC DVD. The programs documentation does not make recommendations. The "Burn to DVD" function looks fairly typical; you select files to include, select one of several menu templates (Figure 7) and optional background image and background music, then select recording options (Figure 8), then click start. But there are some bugs here. On a laptop with no DVD drive it defaulted to burning to a "DVD folder", but then it said "File size exceeds DVD capacity" even though the disk had 50GB free and the clip was 58 seconds. Switching the target folder to a partition with 112GB free allowed it to continue. Several more tries on computers with DVD burners and various input files were not very promising. With one 2-hour file, edited in Windows Live Movie Maker, and thus (unfortunately) in WMV format that has to be transcoded, DMCU estimated that the low quality was needed so it would fit. After a long time, "Burn to DVD" window was sometimes not responsive for many minutes even though the second step was showing 100% done. When it was finally ready to actually burn the DVD, it ejected the disk even though I had put a new blank one in. Then, after another minute it ejected the disk again with "There is not enough space in the DVD disk", even though it was new. So after 64 minutes, I had no DVD. Windows DVD Maker (which comes with Windows 7) made DVDs from the same input file without problems, taking 33 minutes on the workstation but an astounding 2 hours and 17 minutes on the desktop. A second copy took 15 minutes, so most of the long time was recoding the WMV. In another comparison, two 60-minute recordings made by SageTV were burned to DVDs. These are already MPEGs at 720x480, so presumably less recoding needed. Windows DVD Maker took 22 minutes; DMCU took much longer. Two instances of CmdConverter.exe ran at near 100%, so it must have recoded both shows in a CPU-consuming way. Again, during the "Create DVD folder" step the status bar stopped at 100% and it looked like nothing was happening for many minutes. Then, finally after 2 hours and 2 minutes, it ejected the new DVD disk, asked me to insert a new one, then said "There is not enough space in the DVD disk, please use another one." Well, at least it said "please". Invoking the "third time" charm, I restarted a burn with one 60-minute recording . . . 119 minutes later DMCU finished making the DVD . . . don't celebrate too soon . . . the audio was way off, about 20 seconds ahead of the video. Choosing 10 shorter videos, ranging from 20 seconds to about 5 minutes, the create-DVD process finished, but the results played poorly on a Panasonic DVD player, with drop-outs and the sound out of sync. Two more DVDs were burned on a different computer, but the results were jittery, broken-up, and unwatchable. On the same computer Windows DVD Maker made DVDs from the same input that were fine. 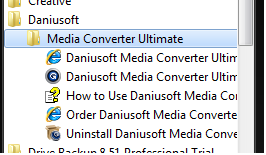 Daniusoft Media Converter Ultimate does not live up to its maker's claims of a "multimedia processing Titan". It is easy to install and use, and it converts media files quickly. It can usually take advantage of mulitple processors in a high-end workstation and dual cores in a laptop. It is good at ripping DVDs, but not very good at burning them. I believe it would remove DRM protections from various media files by playing those files when a license is present and recoding the streams. This is time consuming and may violate the terms of the media source. Documentation is minimal and not very helpful. The large number of options and media types is impressive, but there is little or no guidance on what to use when. Techincal support was very disappointing. Although replies were prompt and polite, I demonstrated a problem in previewing two common file types on 5 different computers, yet they seemed unwilling to believe it was nothing more than a configuation problem on these computers and to escalate the issue, which remained unresolved. Nevertheless, if you need all or most of the functions and would prefer them in one product, it may be worth the $60. If you only need a few functions, the company sells many different products with cababilities that were combined into the Ultimate version. It would be worth your time to try the free trial of one of them or Media Converter Ultimate to see if it meets your needs. Chris Sacksteder is a Systems Design Specialist living in central Pennsylvania and working for THE Pennsylvania State University. During cold weather, his hobbies include all aspects of home media -- TV, movies, music, pictures, home videos, and making many shiny plastic coasters. He's planning to jump to HD soon. First off, GREAT review! Really detailed, and I loved the metrics and tests. Looks like I need to add some HD source files though to the review team media pool - it would have been great to see how this handles HD content. The fact that it only used one core for h.264 encoding is very telling, and it's telling a bad way. There are several video editors around that same $99 price point...so if you're going to spend more than $50 on a video converter, you might as well just buy a video editing package and use that to convert the video, even if you're not doing any actual editing. One question, how is it copy protected? For all kinds of video conversions and audio extractions, I use SUPER from eRightsoft for 0$ which handles pretty much every codec on the market and allows you to fiddle around with even more parameters. For authoring and burnning DVDs, I still use my good old Ulead Movie Factory for which I paid 99$ back in 2004. But I am pretty sure, that there are freeware solutions for that as well now. I don't know what protections it has other than a registration key. The license states you may install it on two of your own computers. For testing purposes, I installed it on 6 and didn't have any restrictions, but they could have adjusted something for my license because I asked first and they said "we'll take care of it on our end" (but I kind of doubt it does that kind of checking). Today the company announced a "Daniusoft Video Converter Free", which of course has some limitations (e.g., 5 max at once). But it would at least let you try converting a large file to see how well it works. The "Video Converter" looks the same as "Utimate", but doesn't recode DRM'ed files, burn DVDs or copy media to portable devices. Interestingly, it previews QuickTime files fine, a problem I spent a lot of time trying to get them to address with the Ultimate version. Hi, your review is good, detailed. I also experience occassional problems of early termination of a file conversion - about 10% of the time. Your screeshots are of v2.6.2 I think. I suffered major problems with V3 - it fails to link to the virtual sound card and therefore cannot convert. As you say the Help Desk is very responsive and polite, and they say they are trying to ascertain the problem. Has anyone else experienced this problem with V3?